I have been waiting a long time for this day. Soft opening day at Timwah Dim Sum Restaurant. Jacksonville has been missing a good dedicated dim sum restaurant for a while now (Blue Bamboo does a fantastic Dim Sum Sunday once a month). There are a few other places but they are mediocre at best. Well I'm thrilled to say that we now have access to dim sum whenever the cravings hit! We had the pleasure of sitting down with the owner Fan a week before the soft opening. Fan is from New York and has trained on how to make dim sum for the last 3 years. Once I heard that, I knew we were in for a treat. We talked a little bit about Jacksonville’s scene as he served us tea and let us in on tea drinking etiquette that we were unaware of (tap your fingers twice on the table to say thank you when someone pours your tea). He was a delight and that made me even more eager to try his food. 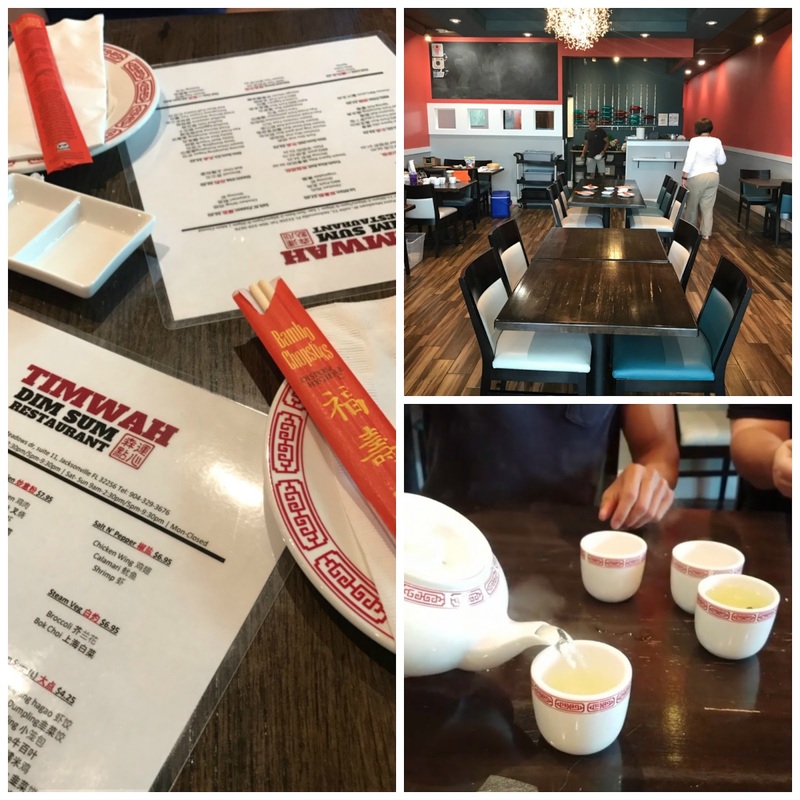 Timwah is now open and Jacksonville couldn’t be more excited! I had plans to attend for dinner on opening day (June 13, 2017) but unfortunately lunch was super slammed and they ran out of food. I was a little upset but also very happy that it was such a success. I would not make that mistake again. The next day I took an extended lunch from work and met a few people for lunch. My husband got there first (right when the doors opened) and grabbed a table. I was 10 minutes behind him and the restaurant was nearly full when I arrived. We quickly placed our lunch order and it wasn’t long before our food started coming out of the kitchen. 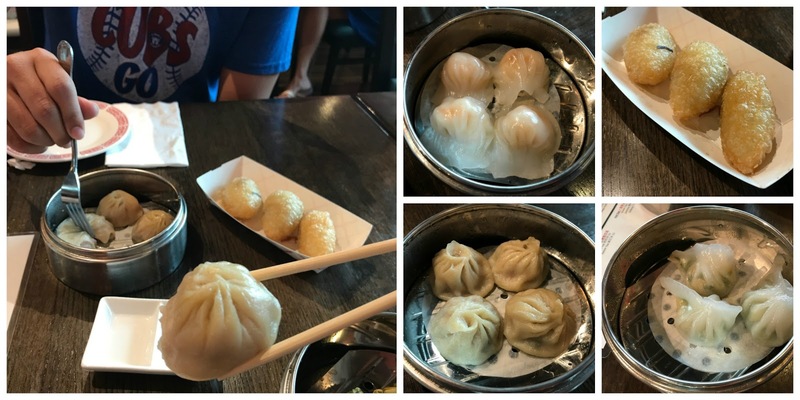 We ordered a bunch of different items for variety including (top to bottom, left to right) Shrimp Dumpling Hago, Fried Pork Dumplings, Soup Dumplings, & Steamed Chive Dumplings). I took my first bite then came to terms with the fact that I will be spending large chunks of my paychecks here from now on. It was exactly what I was looking for. The soup dumplings were delicate and had just the right amount of soup inside. My favorite was the Sticky Rice, but to be fair, I love sticky rice above all else. It was wonderfully sticky with chunks of meat inside. I ate it in a few bites and was very angry with myself for not ordering more. Another standout for me was the Pan Fried Pork Potstickers. 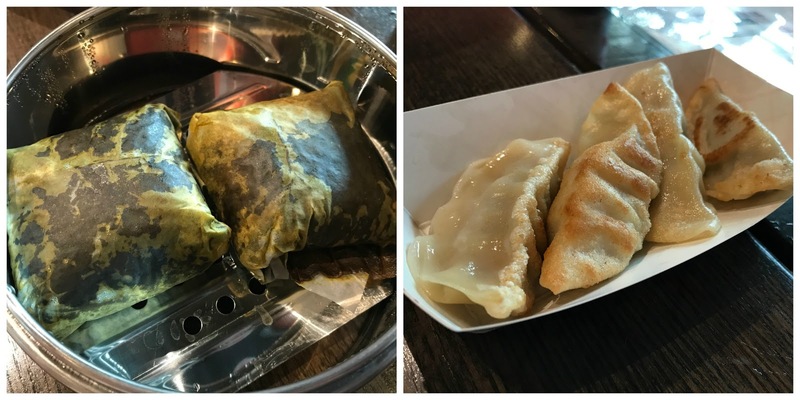 I am a self proclaimed gyoza lover, so I was excited to try these. I was glad to discover that they were crispy on the outside with tender fillings on the inside. They were exceptional but I would have preferred a steamed option as well. There was soy sauce on the table but I would have loved different sauces to dip each item into. But really, that was not a deal breaker and it might come in time once the restaurant is more established. My friend ordered the Salt and Pepper Shrimp and it came out last, which might have been a good thing. If it came out any earlier I would have eaten the whole thing. The breading reminded me of a beer batter breading in terms of consistency. It did have some heat to it so all of my mild loving friends, be warned. All caps were required because it was that good. Everything is made by hand daily and the freshness really comes across in the food. While they have had some issues with running out of food during the soft opening, that is exactly what a soft opening is for. I'm sure the owner could not have imagined how busy they were going to be for the soft opening. As of publication date they have yet to complete a dinner service. They have been running out of food during lunch service all week. Some people have been upset but I call that a huge success! I have been waiting for a great dim sum restaurant and I am thrilled to say that we finally have one!